Since it opened in 2011, Crystal Bridges Museum has been home to one of the most impressive collections of American art in the world. From the landscapes and portraits of colonial times through pop art and other work from more modern periods, the museum’s permanent collection is a pretty good representative cross-section of American art history. State of the Art attempts to answer that question. 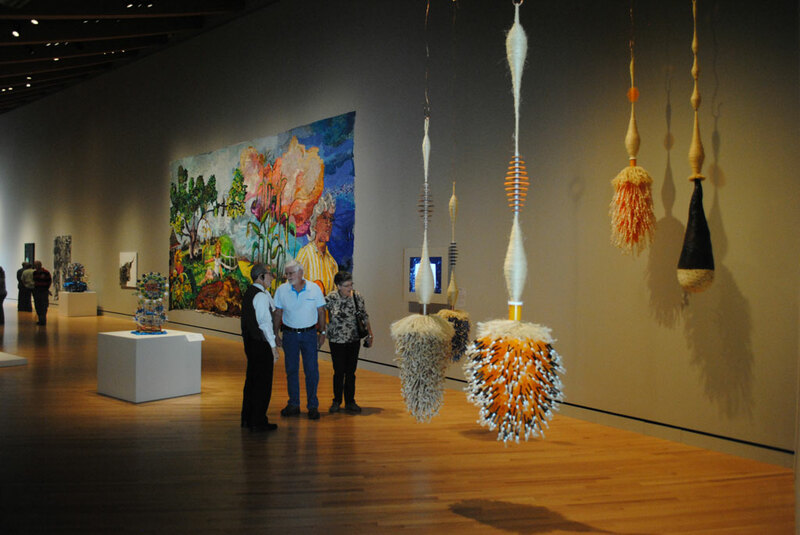 The exhibit, which opened in mid-September and runs through January 2015, features more than 200 pieces by 102 contemporary artists representing every region in the county. “Contemporary art has too often been dismissed as ‘Something a child could do,’ or — worse — irrelevant,” said museum president Don Bacigalupi. “Contemporary artists live and work among us. We can learn so much about the past and other cultures from art. It’s been a lifelong passion and responsibility for me to expand access and understanding of the valuable and important communications embedded within the art of our own time. “The exhibition is a call to action, both within the field and beyond, to pay more attention to the artists around us, and what they have to say,” he said. Museum curators logged more than 100,000 miles crisscrossing the country to visit nearly 1,000 potential artists for the collection. Their hope is to provide exposure for some emerging artists that haven’t been discovered on a national scale. The resulting exhibit, which is the largest in both scope and scale that the museum has ever produced, includes artists from areas not traditionally thought of as art-producing. Admission to the exhibit is free, and no tickets or reservations are required. 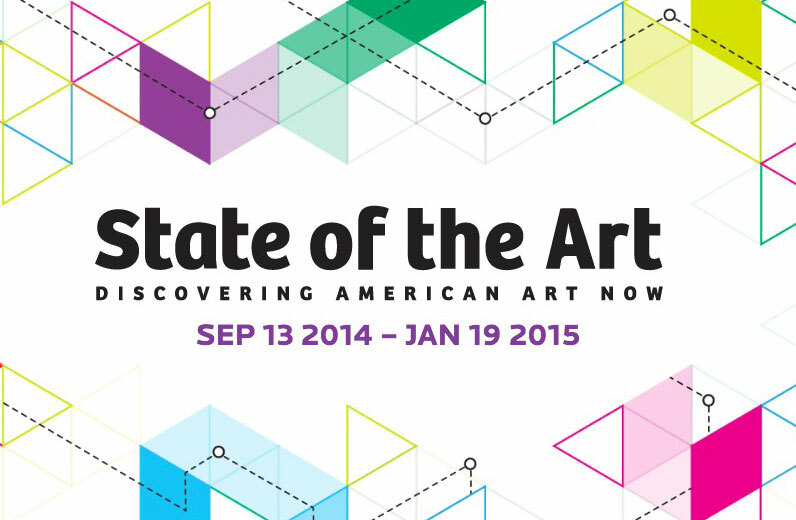 The museum will hold a symposium on State of the Art next month, featuring two days of artist talks, panel discussions, and lectures on Nov. 14 and 15. The symposium is also free to attend, but online registration is required. With over 200 pieces represented in the show, State of the Art is really something you have to see for yourself to truly appreciate. Here are some of the works that stood out to us when we visited the exhibit. One of the most memorable pieces in the exhibit is an installation by Brooklyn artist Jonathan Schipper called Slow Room. 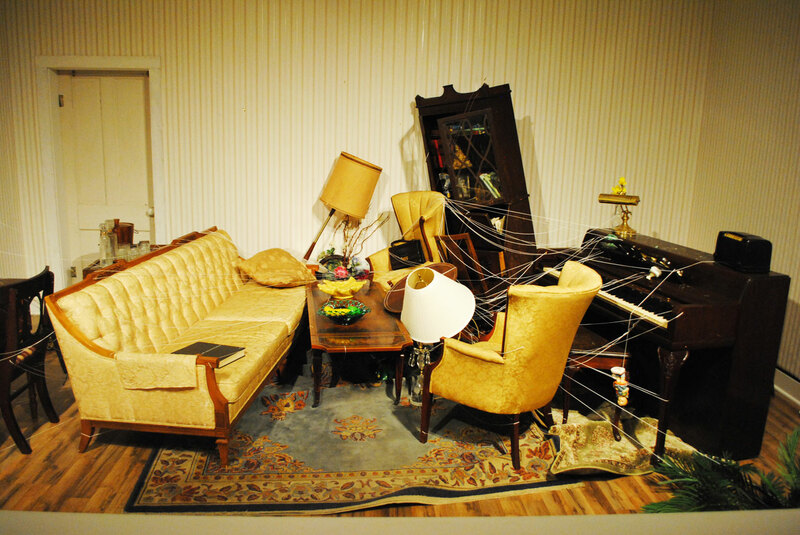 The work features a living room with furniture, plants, lamps and pictures all tied to pieces of string that are slowly being pulled into a hole in the wall. The items are pulled so slowly that their movement is imperceptible, but over time, everything in the room will become intertwined, interlaced, and sometimes destroyed. Jonesboro, Ark. 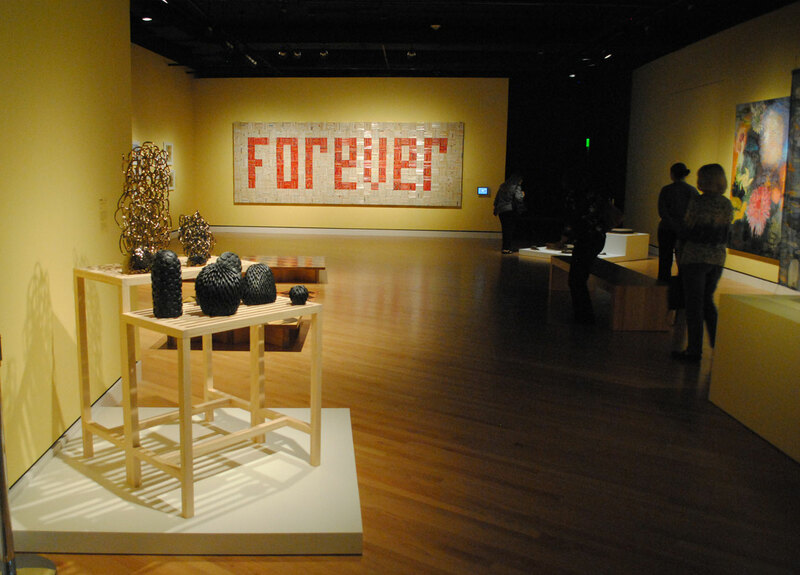 artist John Salvest‘s large piece called Forever was another memorable work in State of the Art. The piece, like much of Salvest’s work, is made from found materials he scavenges from junk stores, antique shops, and yard sales. The wall-bound sculpture, which measures nearly 17 feet long, is made entirely of discarded romance novels. 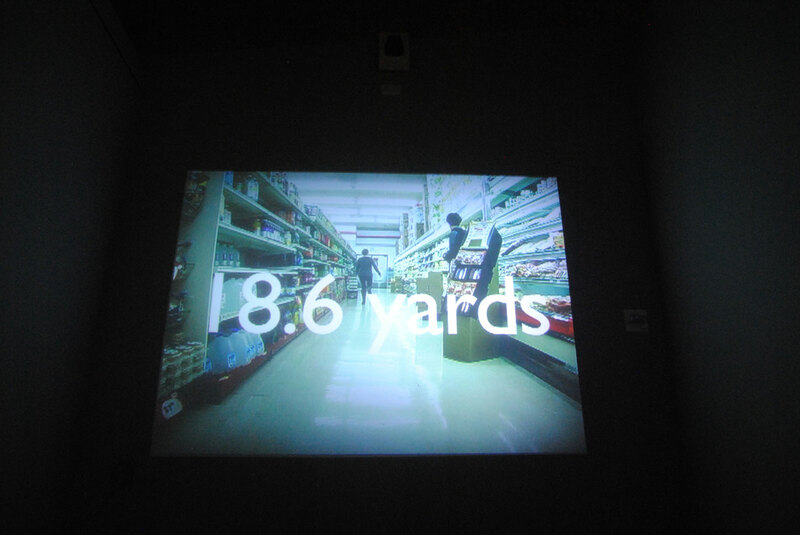 Parents of toddlers will certainly relate to Lenka Clayton’s video installation The Distance I Can Be From My Son and 63 Objects Taken Out of My Son’s Mouth. The video featured Clayton’s 18-month-old son toddling away fearlessly from the camera in various settings, including a supermarket, a grassy field, and an alleyway in a suburban neighborhood. Tension mounts as the child gets further and further away until Clayton finally bolts from behind the camera toward the child when she reaches her threshold. 63 Objects Taken Out of My Son’s Mouth is exactly what it sounds like, and includes items like buttons, coins, bottle caps, and cigarette butts artfully arranged in a grid on a white background under glass. Washington, D.C. artist Dan Steinhilber’s installation Reflecting Room was another standout of the exhibit. 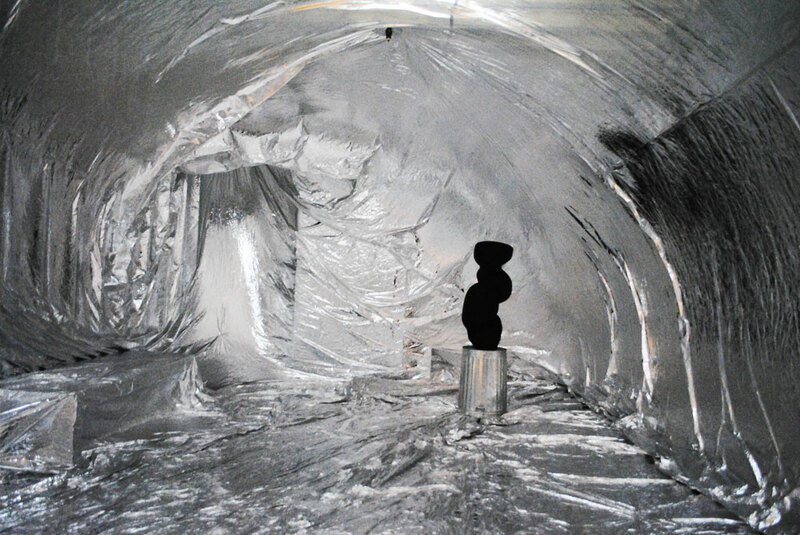 Steinhilber’s work completely transforms a room by covering it entirely with a metallic material typically used as insulation, while a fan expands and contracts the space from the corner. Visitors are invited to walk into and interact with the delicate, reflective space. Like much of Steinhilber’s work, the installation is made from seemingly mundane, everyday materials that are transformed into something more meaningful. Danial Nord’s sculpture state of the art might be one of the most impactful works in the exhibit. 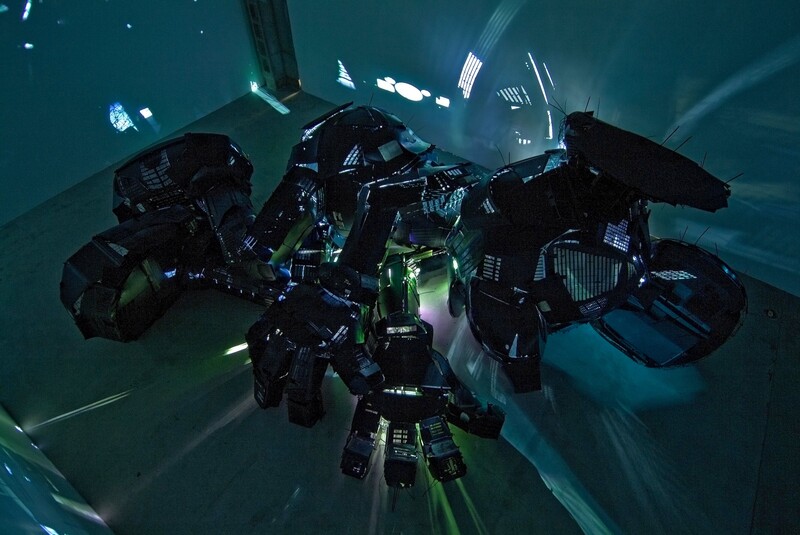 The piece, made entirely of old television parts, depicts a giant, Mickey Mouse figure laying on the floor. The sculpture is presented in a dark room, and is illuminated only by the slivers of light that occasionally flash and escape from the structure. It is only visible once the viewers’ eyes adjust to the darkness. An audio loop made of fragments from the Mickey Mouse Club theme song plays in the room, adding to the unsettling nature of the work.